Recently a study conducted by Duke University, USA and Central Groundwater Board of India has found widespread uranium contamination in groundwater from aquifers in 16 Indian states. Ground water is the water that seeps through rocks and soil and is stored below the ground. After keeping aside 35 BCM/year for natural discharge, the net annual ground water availability for the India is 398 BCM. Natural discharge occurs as seepage to water bodies or oceans in coastal areas and as transpiration by plants whose roots extend up to the water table. West Bengal, Bihar, Chhattisgarh, Assam and Uttar Pradesh. Andhra Pradesh, Bihar, Gujarat, Haryana, Karnataka, Kerala, Madhya Pradesh, Maharashtra, Orissa, Punjab, Rajasthan, Tamil Nadu, Uttar Pradesh and West Bengal. Andhra Pradesh, Bihar, Delhi, Haryana, Himachal Pradesh, Karnataka, Kerala, Madhya Pradesh, Maharashtra, Orissa. Punjab, Tamil Nadu, Rajasthan, West Bengal and Uttar Pradesh. Inland: Rajasthan, Haryana, Punjab and Gujarat; to a lesser extent in Uttar Pradesh, Delhi, Madhya Pradesh Maharashtra, Karnataka, Bihar and Tamil Nadu. Groundwater naturally contains impurities due to nature of geological formations. Industrial effluents and municipal waste seeps through the soil and pollutes the groundwater. Toxic industrial waste releases traces of heavy metals such as lead, cadmium, zinc and mercury. Example: Shallow aquifer in Ludhiana city is polluted by a stream which receives effluents from 1300 industries. 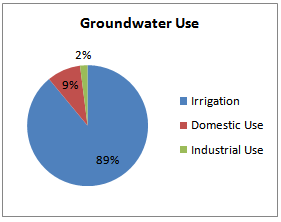 Uranium contamination has aggravated by groundwater-table decline. Decline in groundwater table induces oxidation conditions. As a result, uranium enrichment in shallow groundwater is enhanced. Prolonged intake of high Iron content water can cause haemochromatosis. 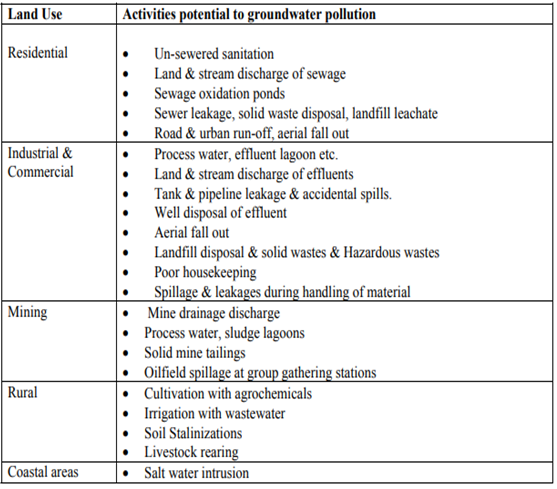 Groundwater pollution can cause certain types of nutrients that are necessary in small amounts to become far too abundant to sustain normal life in a given ecosystem. It highlights the need for decentralised control and the necessity to protect water at the aquifer level. It seeks to give regulatory control over groundwater resources to local bodies. Arsenic Task Force set up. 2005- Setting up of Arsenic Removal Units (ARUs). These were reported as one of the finest performing devises and capable to remove arsenic from very high level of contamination. Objective: to achieve equitable, safe and sustainable management of India’s groundwater resources through improved systems of resource mapping, utilization and governance. Central Pollution Control Board and the CGWB do not carry out real-time monitoring of water pollution in rivers, lakes and ground water sources. Extractions are metered, and compliance promoted through hefty fines for violation for corporations (for up to $2.2million) and for individuals (for up to $1.1million). Replenishing the aquifers in overexploited areas is essential. Financial and legal incentive should be given to individuals to recharge the common groundwater source. Example: In Chennai, rooftop rainwater harvesting has been made compulsory for buildings over three stories. The captured water is directed into the ground to recharge the aquifer. 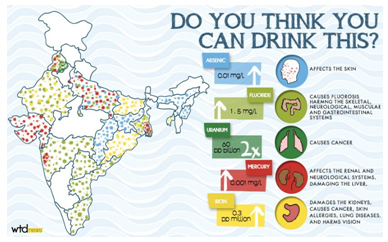 Government should supply quality drinking water to heavily polluted areas. Restrict the landowner’s rate of extraction. Overexploitation of groundwater resources should be charged.